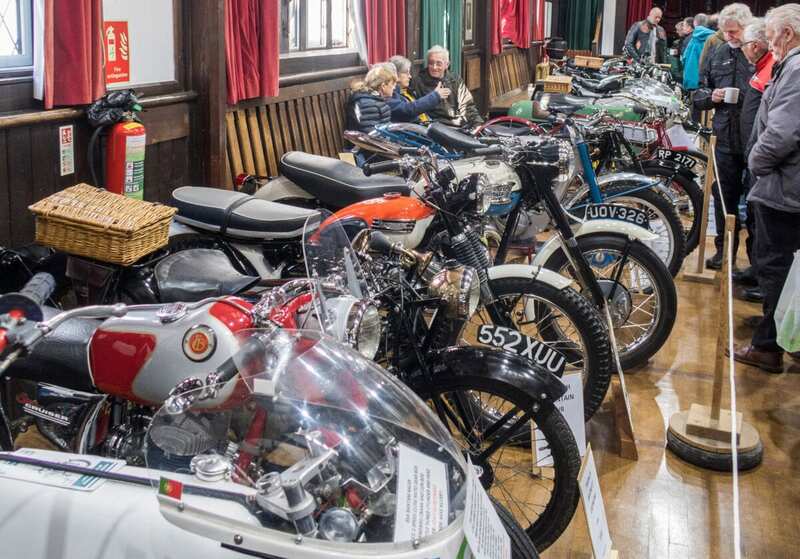 This year witnessed saw the 27th running of the vintage bike show at Wistanstow. 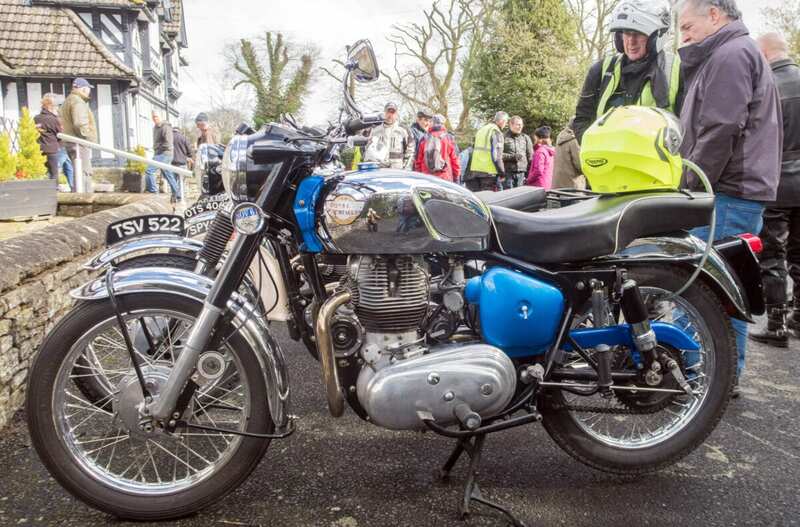 Richard Jones rode through the Shropshire hills to the village hall a few miles north of Craven Arms; a delightful part of the world to visit, irrespective of whether old bikes are on show. As you can see, the church hall, whilst an impressive building, is a bit tight on space when large numbers of motorcycles are introduced. This means the bikes are rather closely packed so please excuse the photography. One of Mr Howard Davies’ finest: a 1926 HRD 80 with a 350cc JAP engine. 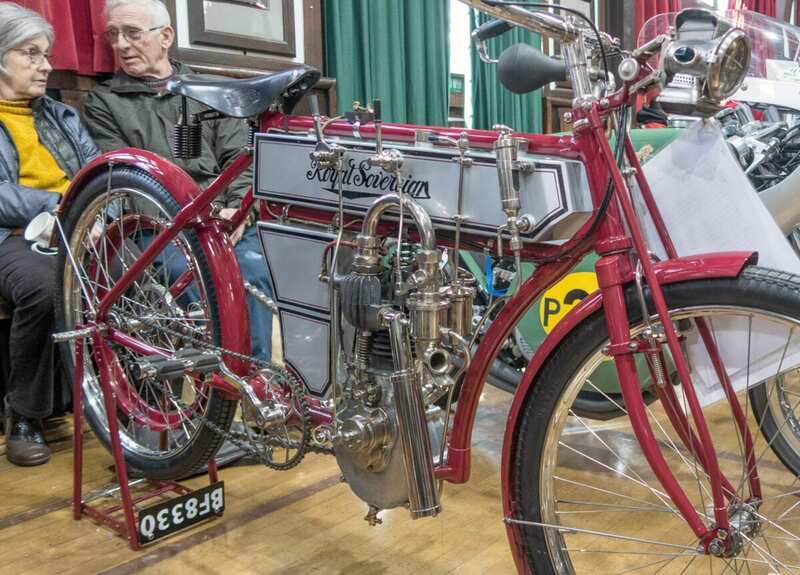 This is the production version of the machine the eponymous manufacturer rode to a second place in the 1925 Junior TT at an average speed of 63.87mph. The following year Freddie Dixon won the Junior on his HRD at an average of 67.19mph. Even in the trim seen here the bike was capable of 75-80mph. Can you imagine the courage it must have taken to ride that fast on the roads of that time on this motorcycle? I mean – it looks so… spindly and the front brake appears to be the size of a small saucer. 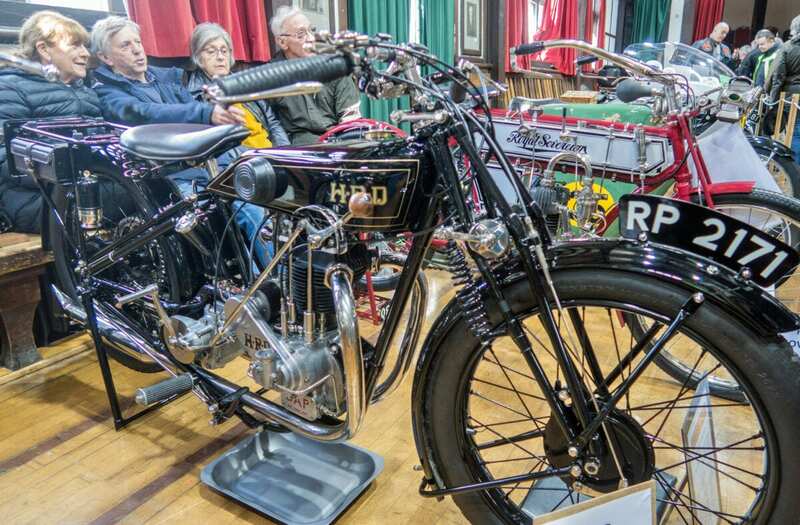 Howard Davies only built his motorcycles for four years between 1924 and 1928 and he complemented the JAP engines with Burman gearboxes, Webb forks, BTH magnetos and AMAC carburettors. Financial problems led to the marque being sold via OK Supreme to a certain PC Vincent but that’s another story. I’d never seen a Royal Sovereign before and had to perform some interesting acrobatics to get some halfway decent photos. A short-lived marque lasting only from 1903-1904, these handsome machines were built by the London Machinist’s Company who resided on the High Street in Kingsland, London. 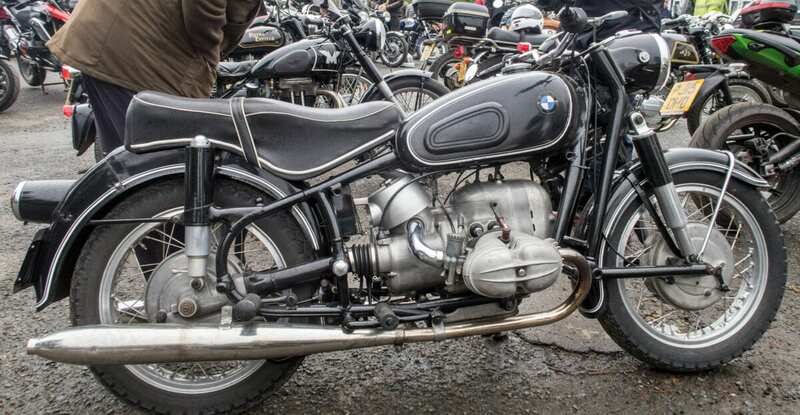 Although Nortons are rather better known than Royal Sovereign, this one is quite a rare motorcycle too. It’s a 1953 International Clubman’s Special with its 490cc alloy ohc engine; a laid-down gearbox and, a first for 1953, a bolt-up wideline featherbed frame made from Reynolds 531 tubing. 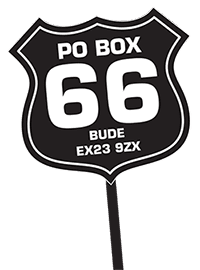 Apparently fewer than 60 were manufactured that year and this one was raced by the first owner, Peter Edward Walsh, at the IoM Clubman’s TT where he achieved 33rd place at an average speed of 68.37mph. In the same race eight of the first 10 places were taken by Nortons – a remarkable feat. There was some more elbow room for photos in the bike park and it was here I spotted a very rare bird – a white Velocette. Dating from 1953, I think it’s a 349cc MAC but I stand to be corrected. Fortunately the more common black Velocettes didn’t seem to have any issues with their albino counterpart. After I finished photographing this rather tidy 1976 Honda CB360 a group of experts (…) were opining that it must have been an import as they had never heard of a 360cc Honda in the UK. 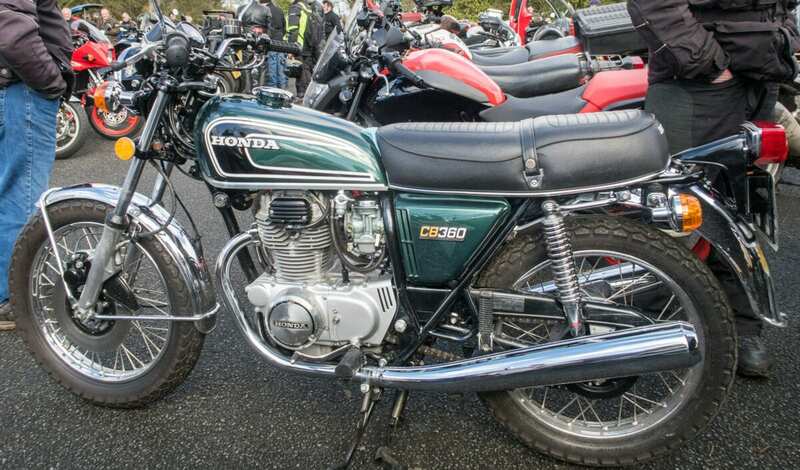 I know the mid-70s were an ‘interesting’ time in my life and 1976 was probably one of the highlights but I definitely remember the CB360 being sold here. Or was it some alcohol-fuelled dream? Royal Enfield originally broke with tradition and skipped the 650 capacity class, creating their 700s instead (it’s interesting that the newly introduced Enfield twins are 650s, instead!). 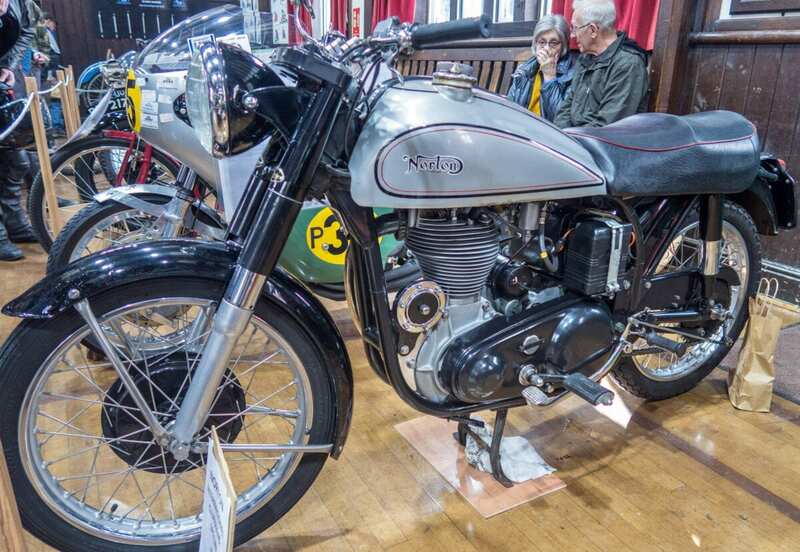 Gordon May, international explorer and a man deeply familiar with Enfields, tells us that this 1961 Royal Enfield was a 692cc ohv twin with special cams, high compression pistons, Amal 389 carburettors, 4-speed gearbox and a top speed of 115mph. Colours were black finished with polychromatic burgundy or peacock blue enamel and the whole cost £299.10s. Tritons always seem to draw attention and it’s good to see one that’s brought out on wet and dirty roads rather than being pampered. 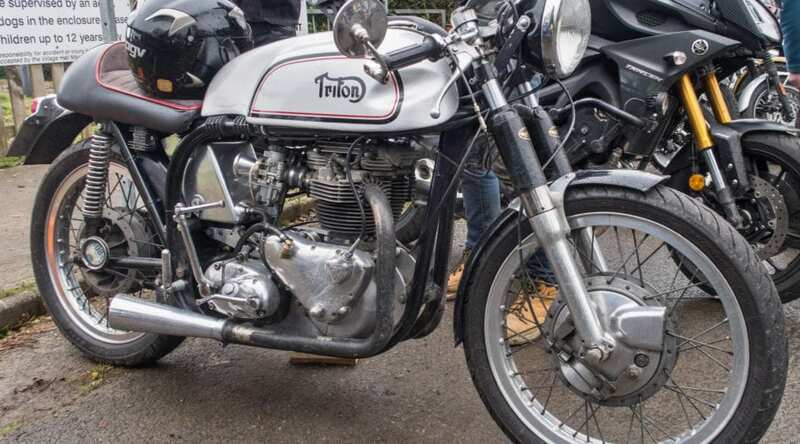 The combination of a feisty Triumph engine in a Norton chassis was always supposed to blend the best bits from each builder, making the most of the pre-unit 650 motor, the great handling from the featherbed frame and the superb steering and stopping from the Roadholder front end. This one is kitted out for quick business with its solo seat, stubby silencer and clip-on handlebars – not even a kickstart or gearchange rubber to make life a little more comfortable! BMW developed their sports-touring R69 into the R69S for 1960, creating the ultimate luxury roadster of its time. The 594cc S engine gained 7bhp over its predecessor, and its 42bhp translated to a genuine 110mph. Unlike some machines of the period where the engine overwhelmed the chassis, the Earles-forked front end and beefy brakes were a good match for the engine output. I still have a soft spot for these older BMW boxer twins despite my appalling experience with the one I owned. This R69S dates from 1961 and would almost tempt me to have another one until Mrs Jones reminds me that oddly positioned kickstart lever can result in a torn Achilles’ tendon. She is always so logical. 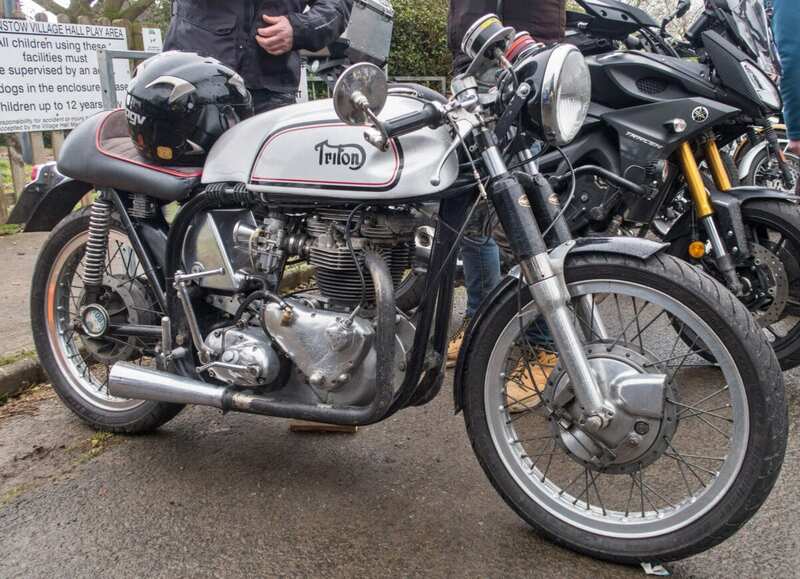 The eagle-eyed amongst you will have noticed that this one wasn’t taken at Wistanstow, rather the Foodstop Biker’s Café outside Bridgnorth where I had taken the opportunity to dry out and drink coffee after riding from the show in pouring rain and sleet. 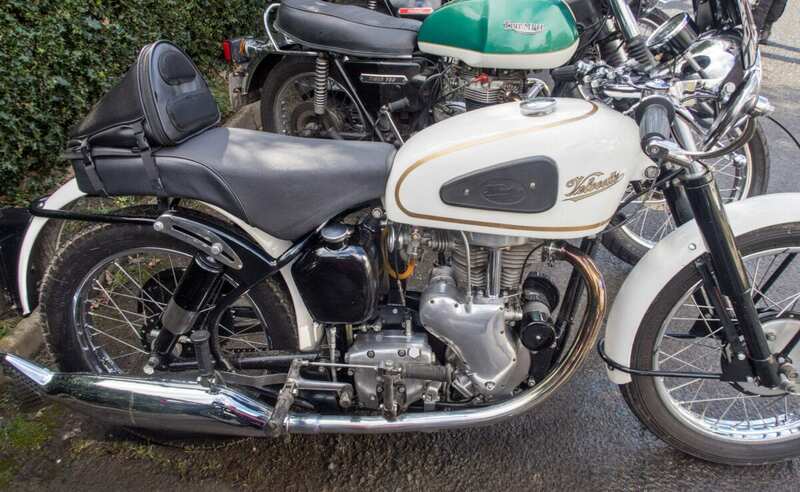 It’s one of the final BSA-Triumph oil-in-frame unit singles, a T25T Trail Blazer, which (like the Royal Sovereign) was in production for a single year, 1970/71. 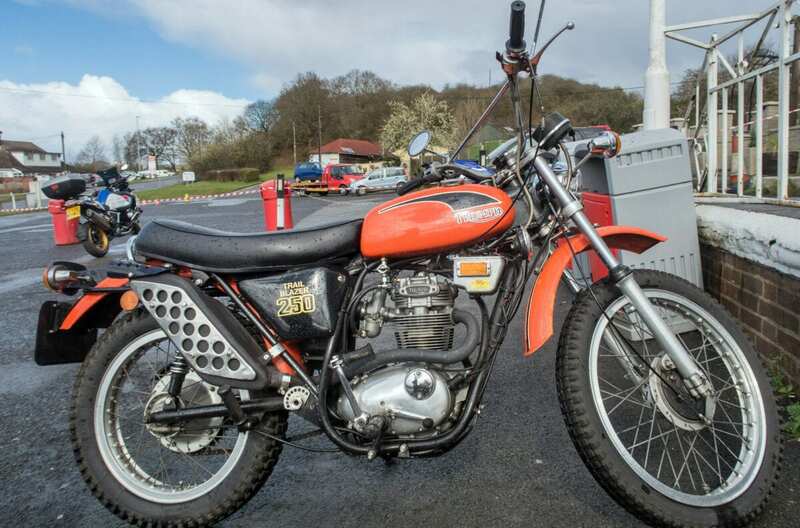 This version is the off-road machine which was given trials-type mudguards, a 20-inch front wheel, higher handlebars and a 6-inch front brake – typically these machines were intended for the American market. UK customers were offered the SS Street Scrambler with a 2ls front brake, smaller wheel and chrome guards. Together with their almost identical BSA equivalents, these nimble 250s have developed with a following over the decades. Next Post:April 2019 issue out now!